Once again it is time for the biggest pop culture event of the year, San Diego Comicon, the "Woodstock for Geeks" which is a celebration of comic books, movies, animation, and all things geek. People from around the world get together to mingle and hear from their favorite artists, actors, writers, and filmmakers in the industry. 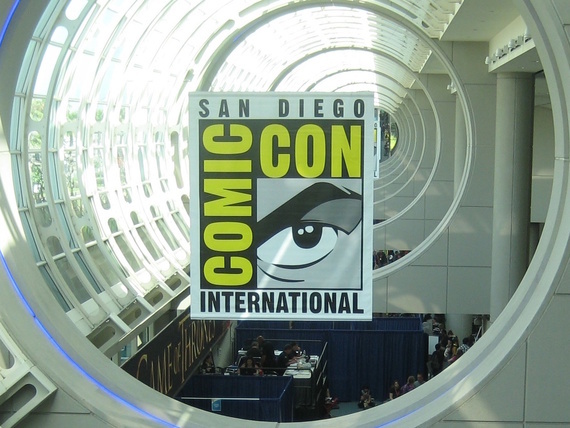 Comic-con features many industry panels, signings, surprise celebrity appearances, cosplayers, and parties. It is so hard to decide what to do, and who to see for all the countless options. One amazing part of the convention that is often overlooked is the Comic-con International Independent Film Festival. All films in this part of the festival have been independently made with blood, sweat, and passion! The major studios swarm San Diego each year with huge, star-studded panels in Hall H, and enormous booths at the convention. Last year visitors camped out in front of Hall H overnight hoping to be admitted into the Star Wars: Force Awakens panel. Being eager to see and hear about the biggest films Hollywood has to offer with celebrity actors and directors is understandable, but what about the amazing smaller films made by independent filmmakers that can use some love and attention at Comic-con too? This is a whole underexposed part of the convention. The International Independent Film Festival runs from Thursday through Saturday at the Marriott Marquis San Diego, next to the Convention Centre in Pacific 23, North Tower. This part of the Convention is free for admission with your badge. It's an easy way to see movies made by independent filmmakers from around the world and talk to them directly! It is highly recommended that you find time to check out the fantastic films scheduled for this year. Here are some of my personal recommendations to see at the festival. Definitely make time to check out the Film Festival times on the San Diego Comic-con website for a full list of films offered for screening. You never know, you could be the first to catch a film from the next Sam Raimi, Kathryn Bigelow, or Jon Favreau. Young (writer/colorist, Carter Family: Don't Forget This Song). 11:05- 12:50. House of Monster: Frank and the Zombie Girl. Christopher Lloyd stars as Dr. Gaulstone, the patriarch of a dysfunctional monster family that includes werewolves, mummies, zombies, and vampires. Frank finds true love when zombies attack the village. Zombie Girl's inevitable decay puts a hitch in their budding romance. Participating panelists include director Dawn Brown (concept artist, Hunger Games: Mockingjay) and producer Warren Manser (concept artist, Batman v. Superman: Dawn of Justice). 11:35- 11:50am. All the filmmakers in the festival have worked very hard to make these films that have been chosen as part of the Comic-Con International Independent Film Festival and they didn't have the budgets to work with that Marvel Studios and Warner Brothers provide! Most of these films were probably made for less than it cost for one day of catering on a Avengers movie. If you are able to, I heartily recommend taking time to come, view, and support independent films while you are at the con.